It's a color me happy kind of day - with a giveaway! Who's up for a giveaway today?!?!? When the crew at Fat Quarter Shop contacted me to let me know that Mini Disco had been chosen as the March pattern of the month, I was beyond excited! I love working with the Fat Quarter Shop, and Mini Disco has been so well received (she's so much fun to make! ), I was happy dancing around the studio. My Robert Kaufman Kona Solids Sunrise charm pack scraps from the Mini Disco cover sample. Here are a few of your Mini Disco quilts! 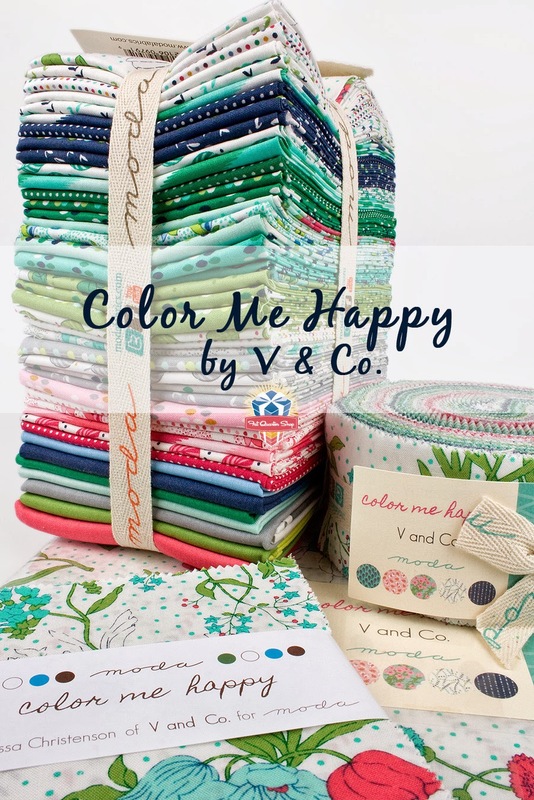 So of course when they asked if we could do a giveaway to mark the occasion, I picked Vanessa Christenson's Color Me Happy fat quarter bundle! What sewing or quilting projects color you happy? Tell us about them in the comments for a chance to win that V & Co fat quarter bundle. Details on how to enter the giveaway are below. 2. 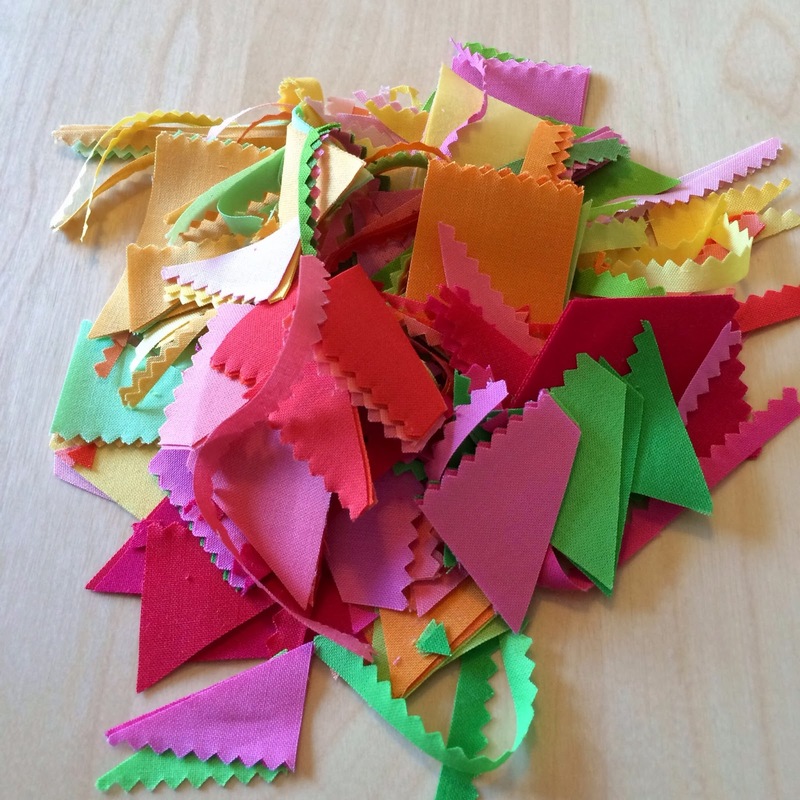 What sewing or quilting projects color you happy? How do you find your quilting joy? You have until 9PM PST time Friday, March 7th to enter! Well the Northern Lights mini in a rainbow colorway makes me happy! I find my joy in making happy color quilts and giving them away. The recipients are always SO pleased! Color me crazy but I love opening a new jelly roll! Unrolling the fabric strips and exploring all the colors is just so much fun. Jelly rolls color me happy! well, i just bought Disco and I can't wait to find the perfect fabric for it! Since I do longarm quilting for others, I don't make many quilts for myself. Can't wait to make this one! 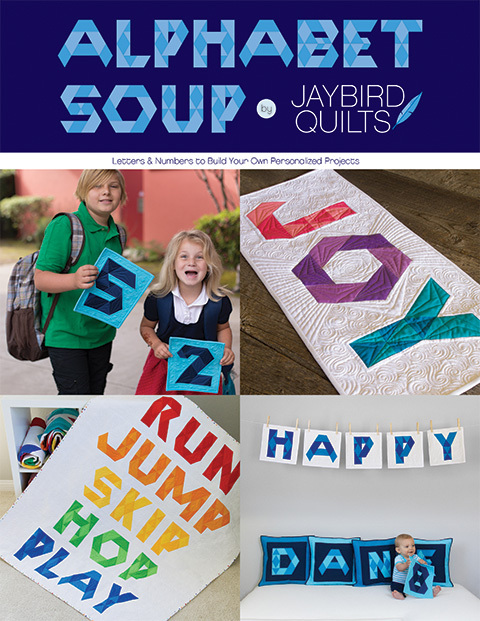 Right now it is a bunch of Jaybird Quilt designs. I just finished all the blocks in Toes in the Sand, started working on Daybreak using Studio Stash, and at the end of the month the LQS is teaching Park Bench. I will be using Tula Pink Acacia for my fabric choice. I guess you can tell I love your patterns. I love to quilt anything. But I think putting fabrics together is my favorite. I have really enjoyed your patterns. One of my goals is to make one of your patterns this year. 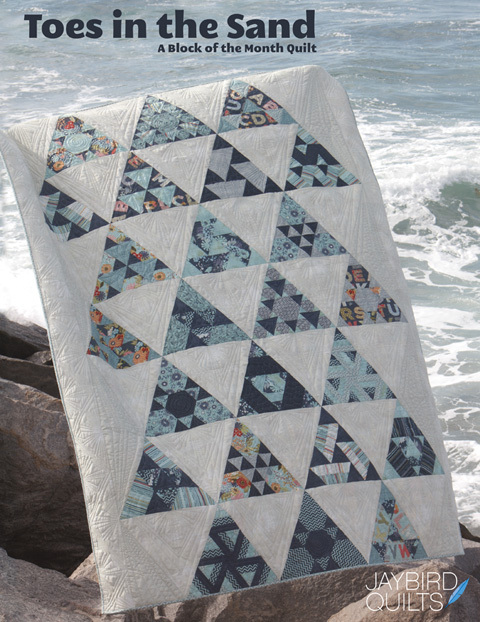 Superb giveaway, my current quilty happiness is found in making a quilt for my brother for a wedding gift, we worked on the pattern and fabric choosing together! What makes me happy - color, color and more color! Quilting happiness - at the moment lots of flying geese! Thanks for a great giveaway - love this collection. Big quilt blocks make me happy right now. I love a big block that goes together quick. Planning a new project makes me the happiest. I love actually making things too, but it's the planning/fabric selection/pattern picking that really gets me! I go through color phases. Recently I've been in love with color order rainbow variations. Then it was brights on white. Now I'm experimenting with value by doing a few grayscale projects. Loving it all! Any project I can do in peace and quiet, alone in my sewing room, makes me very happy! Ooooh! How sweet is this?!! I am currently working on two quilts for two special people who will be celebrating momentous occasions: my niece will be graduating from Nursing in the spring, and my neighbour is turning 80 in the spring!! Any sort of sewing makes me pretty happy. Garment construction. Quilted bags and totes. Tech cozies. Even a quilt now and then. Love quilting most anything. I like being at the sewing machine as long as it is not rip out and do over of any sort including mending......ugh! I'm making my own design of HST star quilt at the moment using Tula Pinks Acacia collection, it's a beautiful rainbow. I tend to get inspired by stuff on Pinterest and make my own version, often colour matching to where it's going to go! I am finishing only 4 batik placemats, just made 6 burp cloths and a couple of bibs. and just 1-2 hours a day for 2 days. I love your patterns! Anytime at my sewing machine is a happy time. So many beautiful fabrics and so many beautiful quilt patterns to make them into. I need more hours in a day :-). Your patterns inspire me. Keep them coming! I have let each of my nieces and nephews pick out a quilt when they are teenagers. It has to be lapquilt size, but otherwise they pick the pattern and the fabrics. I love to see the colors and designs they choose! Definitely not what I would pick, but so fun! I love color placement. Taking the same block and helping parts come forward or become part of the background depending on the fabric put in the various pieces within the block. It is like turning a kaleidoscope. That is my joy: freedom to experiment and create. Certain points in the quilting process are amazing - when piecing and you can just start to see everything come together! Or finishing!!! I make and donate quilts for kids in the US via Project Linus, and that's fun because I get to use the whole rainbow if I want! I find my quilting joy by making quilts for others, but also by teaching the tradition to my nephews. I follow your blog, and hope to make some of your quilts soon. Making minis and mug rugs make me happy so I can practice free motion quilting before I do a big one I have waiting for me. I love all colors. I have such a hard time not using them all. Love reading your blog. Thanks for the chance to win some beautiful colorful fabric. 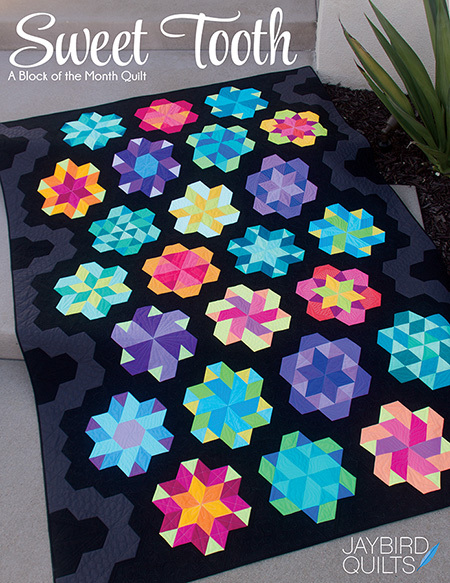 I saw the Northern Lights made up and quilted & I think that would be a "funky" one to make. Out of my "box" so to speak,but a nice change. Thanks for the chance to enter. Yay! The sun is out!Have a great day! I am in the midst of a color me happy mini disco...amongst several other things. Thanks for the opportunity to win fabulous fabric. If I win you could most definitely color me happy. What wonderful bundle to choose! Working with wonderful fabrics colors me happy - even if the colors are neutral. Like I always say...I love *all* the colors! Picking the colors make me happy. If its for myself or someone else getting to play with the color is the best part ever. I love playing with fabric and thread. Longarming, machine embroidery, making quilts, curtains, handbags.....just love playing with fabric and thread. Anything to do with baby quilts or cot sheets. bibs and burp cloths is colouring me very happy at the moment. I'm sewing for my new grandaughter, due next week! I love color, especially bright colors. I often tell people that color makes me happy, so that is what I am drawn to when I quilt and purchase fabrics. Sewing baby quilts makes me happy. Not only am I carrying on a tradition started by my grandmother, I am welcoming a new little person into our family with something they will cherish forever. Pretty much all sewing makes me happy. I especially love making quilts for others...the whole time I am stitching, I am thinking of that person and I love seeing their surprised face when I give it to them. Bright cheery colors make me happy. I love making bags and quick quilt projects. I take a pattern I like and put my own spin on it, whether that's using color combinations that speak to me or changing the block arrangement a bit. I find my quilting joy simply by being in my sewing room. My happiest quilty moments are diving into my big scrap jars and doing some improv piecing. No rotary cutter, patterns or rulers(Sorry, Julie!)... just playing, unwinding, being spontaneous, and no rules! happy happy. My current quilting happiness is making a quilt for each of my three kids. Each have chosen their own patterns and fabrics. A memory quilt from old clothes for the eldest, a half square triangle for bright solids for no.2 and an English paper pieced hex quilt for the youngest. So much fun and lovely to see their designs come together. Thanks for the giveaway. Right now bright spring colors are making me happy since our weather in Philadelphia has been so snowy this winter. I find my quilting joy by getting into my sewing room every day, a definite benefit of being retired! Thanks for the giveaway. It is usually bright, clear fabrics that make me happy. That said, I am in the process of one with low volumes and very little color and I can't with to see how that turns out. Thanks for the giveaway. I love gray with bright colors. Love improv quilts, log cabins, wonky stars! I find a lot of quilting joy in making quilts without following a pattern. Having an idea and figuring out how to make it is time consuming, but it is happy work! For me blue + red combos are happy colors. Maybe it is the nod to primary days but I love them! This time of year, it always makes me happy to sew sundresses for my daughter! Oh my goodness I *love* this bundle! I would totally make a quilt JUST FOR ME! I have yet to keep one of my quilts, and have make more new baby quilts, but this one would be mine, all mine! Love selecting colors for a project. Currently picking fabrics to start Park Bench!! 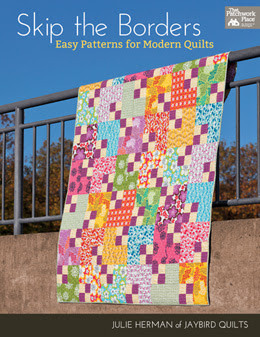 Looking forward to class starting on Saturday at Material Girls quilt shop in La Plata, MD. THanks for the giveaway! Paper piecing has been bringing me the quilting happy lately. It's not so much the technique as it is the ability to control the color placement and accuracy of the piecing. I find joy in making colorful quilts, whether the tones are subtle or bright. Mostly I make them scrappy. I was just thinking about colors the other day while happily quilting away. I can honestly say that I love all colors, especially when they are in a beautiful fabric! I also love finding new color combinations when choosing fabrics for a quilt. Thank you for the opportunity to win some great fabric!! Anytime time spent quilting makes me happy! I love getting together with my sewing group and we just have the best time! Thanks for the incredible giveaway! Bright fabrics and quilting with friends make me happy. Thanks for the chance! I always like a slash of red or yellow to make my quilts happier. Beautiful fabrics and great giveaway! Thanks for the chance! I work in a fabric store so it colors me happy to open a box of fabric that just arrived! We squeal and dance around the office. I get my motivation to sew from teaching. I love how happy people get when they learn something new! It's pretty joyful for me to donate fun, unique quilts to the children's hospital where my son has spent a lot of time. I know first hand how meaningful it is to be given a handcrafted quilt--to know that someone I haven't even met cares. I'm happy to pass that along. Making baby quilts for newborns. Any time I get to quilt colours me happy!! I've been sewing American Girl doll clothes for my granddaughter's birthday.... back to quilting soon. Would love to win your awesome giveaway! What wonderful happy colors! I just love to make quilts with bright happy colors and then to make someones day when they get one of my quilts! That is what it's all about for me! Color with a contrasting neutral makes me happy! I love it when I use white or gray to make the colors "pop" more. Sewing anything that will be quilted makes me happy-- from mug rugs to quilts. I find my quilting joy from opening bundles of fabric. It's like a little present. I unwrap each fat quarter and lay it out. Then I overlay the next fat quarter over it, etc. this gives me a great "view" of the colors and how they play with each other. Julie, I certainly enjoy the whole process of making quilts and things, and combining colors and fabrics that work really well together - but my GREATEST source of happiness is the response to my work... The best remark someone has made about a quilt I made for them was "This is the most fabulous piece of usable art!"... Usable art! I absolutely LOVE that! Anytime I am sitting in front of my sewing machine, I'm happy. It means I have everything in the house all caught up and I have ME time. The projects that make me most happy while sewing are those I am making for babies because everyone just loves gifts for their baby. I'm also VERY happy it is not for MY own baby. HAHA I'm way too old for that now, but I'll take a new grandbaby anytime. 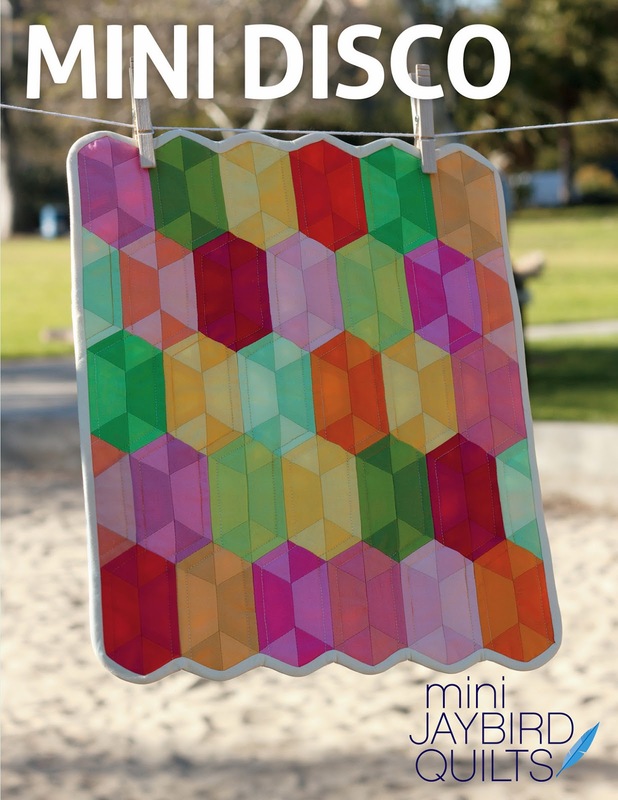 Mini disco quilts color me happy right now! Hand sewing makes me happy! I started my Dear Jane quilt and will be hand piecing it. Love it! Right now my round & round quilt in progress is making me happy! Would love to use these fabrics for my next quilt! Thanks for the chance! I love getting fabric in the mail, anything purple! And finishing a project! A happy quilt for me is bright fun and challenging! I LOVE to be tested and to try new things! I love the look of 'traditional' colours, bur cannot bring myself to work on them! My daughter has recently learn to quilt, her interest has renewed mine. I love Modern Quilting!! Making quilts and giving them away makes me happy. And yellow, yellow always makes me happy. What a great giveaway! Just being able to find time to get into my sewing room at all colors me happy! With three kids aged 5, 3 and 1, it's hard to find a spare moment. When I do, though, I love watching an idea come to fruition as the fabric for a project gets sewn together. This Color Me Happy bundle would be perfect for a project I've been wanting to do for awhile -- a giant single NY Beauty block. I've been waiting for Color Me Happy to come out specifically for that project! It makes me happy to finish a quilt. With 3 young children and a job outside the home, I seem to have a lot of unfinished projects. But, every minute I have to work on something makes me happy and every completion thrills me. What a lovely giveaway. I find any quilt that I can sneak in some teal makes me feel like I've sewn joy into it. I love all quilting anything that has to do with color. I love to sit in my craft area and layout the fabric and just play w the colors until I see it! I get lots of inspiration from your patterns like the Mini Disco! Thanks for all the social media stuff you do it keeps me creating! Right now I'm drawn to browns and teals. Im collecting some fabrics to make you Lotus pattern! I love vibrant happy colours. But just finished a quilt in toned down teal, yellow and white and that combination also made me happy. i love any kind of quilting projects really. most especially the ones that i've had in my head of a long time and seeing it turn out the way i wanted - those make me happy dance! Making star blocks are probably my favorite. It always leads to some fun quilting. I really like making quilt projejcts out of solids especially bright colors which I know is not theh norm. But then again I was never 'norm'. Thanks for this. The quilting projects that make me the happiest are those that use bright colors, those that are gifts for family or friends, and those that come from some unexpected flash of inspiration. If I'm not making quilts, just looking at them can also make me happy. It's all good! BOM or block exchanges with my bees make me happy because I love the uniqueness of the blocks and the variety of fabric patterns in the blocks. I'm straying away from quilt patterns that look too symmetric. I love quilt alongs. I am working on one now, and love how they keep me motivated and I get to see everyones quilts come together as well. Anytime I get behind my machine, I feel the tension leave and the smile form. I love scrappy projects. Thanks for the fun! Throws or quilts that I can use and see every day. I have very little time to sew, so projects I can see coming together quickly make me very happy. My husband says I'm a completely different person when I sew. Your Rock Candy pattern was an absolute delight to make. Seeing those points come together so beautifully, it was lovely! I love V&Co. Fabric lines. There are a couple of quilts in Vintage Modern that would look great in that line. Love your patterns and your creative mind!! 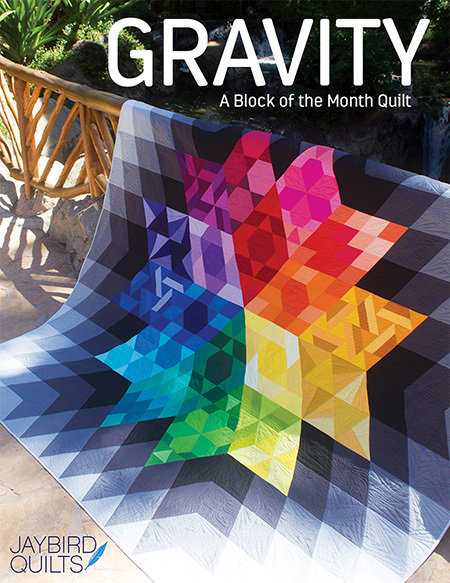 There is nothing more fun in quilting than starting a new project--especially for a gift. I love making quilts for the special people in my life. I love starting a new quilt with piecing. Gorgeous pack!! I've recently picked up sewing again after taking a 15-year break and finished my first quilt over the weekend! I've caught the bug, and I want to be a fabric hoarder now. :) Thanks for the giveaway! What sewing or quilting projects color you happy? I mostly love making gifts for others that I know they will treasure through the years! How do you find your quilting joy? One of the most important quilting projects I do is participating in the do Good Stitches Nurture Circle every month. This absolutely colors me HAPPY every month knowing that I'm using my talents to give back! Right now, the brighter and happier the colors of the fabric, the happier I am with this dolldrum weather outside. I'd love a bundle from this line. Bright, happy colors do it for me. I get joy making childrens charity quilts. I know their little faces light up and know they have something that is only theirs. You can color me happy anytime when I am surrounded by pretty fabrics. I'd rather buy fabric than food at times lol. As for quilting, well I can't stick to just one project so I am currently working on a 1930s hexagon table runner, a bag and a pinwheel quilt. I love making lap quilts that I know my loved ones will wrap them self in on the couch to relax! I love fabric. I might actually love fabric itself more than quilting with it. It makes me happy. But so do my projects. Any quilting project colors me happy! Quilting & sewing is physical therapy for me as I recover from spinal cord injury & surgery. It's hard being home most days, so I enjoy creating as a way to stay encouraged. I love all colors, so my mood dictates whether I use cool colors or bright ones. Great giveaway, thanks! I am working on a flannel quilt. So comfy and warm for winter. I'm a blue/green lover...but I'm challenging myself to venture into the reds/oranges/yellows. My quilt projects color me happy!! Love this line!! Making a quilt as a gift and sewing love into every stitch makes me very happy. Especially hand stitching the binding. The colors I love are bright and cheerful. My passion is to create things for my family. Quilts, clothing, household items..anything that makes people feel special. Anything solid colors me happy, they would go great with Vanessa's color me happy. I really love happy, pastel colors. My favorite color combination is soft coral and aqua, those color me happy! Thank you so much for this lovely giveaway, I would love to win this gorgeous fabric! What I call "drenched in color" fabrics make me happy. Sewing just for fun makes me joyful! My happy has been buying fabric lately with visions of what it will become :) Being 8 months pregnant makes creating a little difficult, but my head is spinning with ideas. I am really loving the mini-quilt trend going on right now!! I just want to decorate my walls with them!! I love finishing a quilt, just finished one that i have worked on for 4 months.Love to sew with happy colors, they make the whole quilt come to life. I have a couple of your charm packs, thinking placemats from them. I love to sew and create beautiful, colorful gifts made with love. Thanks for the chance to this happy bundle! Lately, free motion quilting has been coloring me happy. I'm not so great at coming up with designs on my own but I'll go to town once I've seen some inspiration from others. Congratulations! Making quilts for my family makes me happy. Thanks for the chance to win! I love handling and admiring fabric; the colors and designs delight me. Choosing which fabrics to use for a project is lots of fun for me. I find my quilting joy when I can make the time to quilt! Not always easy. I love the Color Me Happy line of fabric. Thanks for the giveaway. The entire process of making a quilt makes me happy. I have so much fun choosing a pattern, picking the fabric, cutting it up, sewing it back together, quilting it and finally seeing the results. Love to quilt using precuts, either jelly roll or layer cake - I have found I finish a quilt much quicker using these. Love bright colors. quilting is joy for me ... takes away the problems of my world and makes me smile. thanks for the giveaway -- it's a beautiful fabric line! A finished project colors me happy and if it incorporates V&Co fabric, even better. I love opening a jelly roll! Love seeing all the fun patterns & colors! I love to make quilts & give them away as gifts; especially for baby! I am just starting the Night Sky quilt. It took me awhile to get started because it made me happy to just looking at the stack of colorful fat quarters. I have been admiring the Color Me Happy, it will probably be my next project. I am new to quilting so choosing the pattern and getting the fabric is so much fun for me. I have found that fabric purchases are now my escape and my alone time. With a newborn it is hard to have time to quilt, but I know one day I will get to it. right? My appliqué quilts make me so happy!! They take a year to make so it can take a long time to feel the joy of a finished quilt, but well worth it. 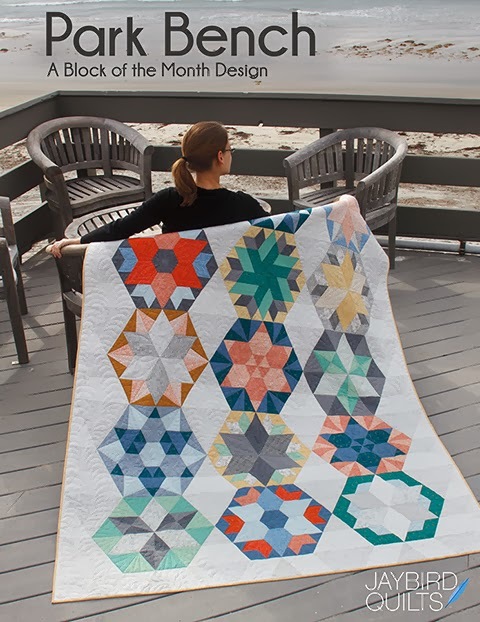 I also love the hexie….I cannot get enough of the Science Fair pattern and I'm anxious to use my new "mini hex n more" template. Do you have any patterns for it yet?? All my projects make me happy. I love my Arrowtail and Super Mario quilts - the bright colors make me smile. Every new fabric bundle makes me happy! Jelly roll, charm pack, fat quarters, all of it makes me happy! I love finding the perfect pattern for fabric that I already have, or finding the perfect fabric for a pattern that I've had my eye on. Mostly I love fabric! I love fabric and baby quilts are one of my favorites to make. I love the feeling of seeing a finished project and baby quilts come together so quickly. Thanks for the great giveaway! My favorite part of quilting is the planning stage. Choosing fabric makes me so happy. I love to get lost in deciding which fabrics go best together. What makes me color happy are neutrals with one bright color accent! Colorful, scrappy quilts make me happy! I ma finding happiness in solids these days, making qu9ilts from City Quilts. Can't get enough! I love making things for others, so determining their style and color is one of my favorite aspects of quilting. Spetzie at att dot net. Thanks for the chance! I love quilting the most, but other areas of sewing intrique me as well. I am just getting starting in frame quilting on a midarm, and it is quite interesting. I love bright colors. My recent projects have been red and white quilts. Actually, I love working with most kinds of fabric. Quilting is my happy place. I love bright colors!! That is what makes me happy. Lately I have been drawn to pinks and purple. I have to get out of this rut and make some other colors. Love the Mini Disco quilt. They look like jewels. Thank you for sharing. I am learning slowly how to quilt properly. I would love to do a spring themed quilt/pillow. Your disco design is beautiful. Colors that make me happy - colors of spring/summer. Warm times - beaches, pastures of spring wildflowers. Blues, greens, yellows, pinks, oranges,.. Brights...Solids, Prints and in-betweens. I just need to find time to quilt at all! But I am looking forward to getting some Color Me Happy to work on some blocks from 500 Quilt Blocks. Warm colors color me happy. Thanks for the chance to win such beatiful fabric. I love all kinds of fabrics, but what makes me most happy is making baby quilts out of 30 fabrics. They are so sweet and fun. I'm also finishing an Irish quilt out of florals, mint greens, and soft pinks. I love fabric, all fabric. I believe even ugly fabric isn't ugly if you cut it up small enough so it doesn't take much for me to get excited. If a quilt isn't going well I might just cut it up in squares and make a scrap quilt out of it. Nothing goes to waste in my house. I just like to sew and sew and sew. Too bad housework and cooking get in the way but then I like cooking and gardening too. I think I will need to live a very long time. Working with bright batiks makes me happy. I imagine myself on a warm tropical island relaxing while being wrapped in an assortment of lovely batiks, when in reality, the temperatures are -10 degrees where I am. Such beautiful fabrics! I personally find quilting to be very relaxing. Plus, working in a science/research job, it is nice to let my creative side come through in the evenings when I'm home from work. My favorite part is making something unique and special for a loved one. From selecting fabric to making a pattern choice and finally presenting them with the labor of love... I adore making things for people! I find happiness in quilting for my family and friends. I still have so many To make for them, but every time I give one away, I see how happy it makes them! Working on a variety of projects makes me happy. I love to play with colors, or themes, and sometimes make the same quilt in a different colorway. Seeing what I plan (and think it will look) and how it comes out (sometimes different, sometimes better) really brings me joy. Thanks! Anything I'm sewing on lately makes me happy, because sewing time is always at a premium these days. But next up is something bright - and Color Me Happy will fit the bill nicely! It's the projects with the fun, bright colors mixed in with lots of negative space that make me happy. I LOVE those Color Me Happy projects! Gorgeous colors! A Beginner Quilter, I'm making quilts for my future great grands; this makes me very happy! Color, Color, Color! That is one lovely bunch of fabric. Color me very Happy, if I win. Making quilts makes me happy, very relaxing. What makes me happy is just getting to create quilts with such beautiful fabrics. I love working with color and pattern to make every creation my own. I am new to quilting having only completed I. My plan is to become confident wilt precut pack to eliminate cutting errors. All bright colors make me happy. Just learned we have a new great grand baby coming. So looks like a gender neutral is upcoming!! Hooray !! I love looking at quilt blogs and finding great patterns!! Right now anything that says SPRING makes me happy--table toppers and wall hangings are the best to cheer up a long winter!! V and Co always come up happy designs! And add them to your innovative piecing and you can't miss having pure magic! Most projects "color me happy" Currently using what I have to make Bonnie Hunters' Celtic Solstice and really bit off more then I could chew, but am plugging along. I love the color display in jelly rolls and charm packs. What makes me so happy is making quilts for those I love ... I love the color choices, I love the surprise of it all, I love picturing the look of delight on their face when they realize the gift of love. Right now, simple projects that I can finish quickly. Thank you for a fabulous giveaway, those colors are just so happy too!! The thing about quilting that makes me happiest is when I master a new skill (perfectly matching HST points!) or when I finish binding a quilt. But it also makes me happy to see my kids bundled up in quilts I've made for them or catch them reading under a well-loved quilt. Okay, I love everything about quilting! I love your mini-quilts. I am not brave enough yet to try one!!! My favorite color is purple, but all my quilts seem to be black and white. lol. Just sitting behind the sewing machine seems to make me happiest. I can clear my head from the sound of the machine running!!! Thanks for the giveaway and good luck to all. Picking the fabrics for a new project colors me happy and when you are finished and you step back to look at it and see that the quilt looks exactly as you imagined it would is the best moment. I enjoy making purses and small quilts. Thanks! The colors that make me happy are all the bright spring and summer colors. This has been a long winter and I am looking forward to happy bright colors. What ever new quilt I am working on brings joy. I find I can get lost in the project and not even realize how much time has gone bye. I love using the Bonnie and Camille lines of Bliss, Ruby and Marmalade in my Double Wedding Ring quilt. The colors make me so happy! Thanks! After a long cold winter, spring colors are making me happy right now. I am in the process of creating a bright new craft room to create my quilts in. Loving this "happy" fabric line! Quilting all day while my kids Are at school makes me very happy!!! Right now I am loving dark backgrounds with bright pops of color! Love all of her collections. Thanks for the giveaway. I love working with teals/aquas and greys. And purples! love finding fabrics that make you feel happy. putting them together and getting a beautiful quilt in the end. thanks for the chance to win. Color Me Happy Makes Me Happy!! The colors are beautiful. I am happy making any quilting project!! Reading quilting blogs make me happy as I am just learning to sew. My daughter really wants me to make her some clothes so when I am confident enough to try my first pattern I will be really happy.